Aikido is practiced together with a partner in its basic stages of training. Each person takes turns being the attacker and defender. 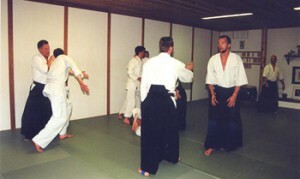 This creates a mutual understanding in practice; learning to receive the technique is just as much a part of the learning process as it is to learn to apply the technique in defense. Aikido does not have competitions. Competition creates a win/lose situation. In the spirit of Budo (Japanese traditional martial arts), the person who attacks unprovoked has lost already, morally as well as physically. Aikido is practiced as a Budo; this means that we practice together, learning from each other and learning to control our techniques so that we are able to apply them so as to never damage or hurt our partner. But by learning this control we are also able to learn what is necessary if our techniques must be applied in a self-defense situation. 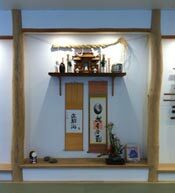 The training environment in an Aikido dojo is based on the principle of give and take. The Sempai (senior students) learn to take care of the Shoshinsha (beginners), just as they once were taken care of by their sempai when they began.